Very early in my F1 blogging days, I asked the question, "Who owns F1?" That led to a fascinating discussion with the man (Mark Higgins) who wrote the Wikipedia entry on that subject and I think I now have a much better understanding of how everything fits together. 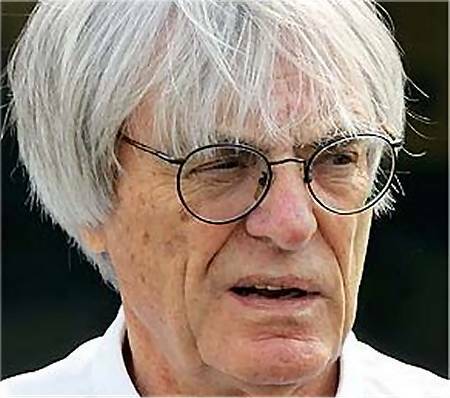 Basically, it turns out that F1 is comprised of two parts, one owned by the FIA (the governance of the sport) and the other (the financial rights to televising and merchandise) by an investment company named CVC Capital Partners (CVC) and fronted by our old friend, Bernie Ecclestone. I confess, however, that the recent political shenanigans behind the scenes have raised a question in my mind that I cannot answer and it occurs to me that my excellent commenters could help me on this score. Let me explain. Suppose for a moment that the struggle for power between Bernie and Max Mosley does result in a breakaway F1 series (no doubt named something else, such as GP1, but the new "pinnacle of motor sport"). There are logistical problems to be overcome, I know, but nothing insurmountable. The biggest problem that I discern is how CVC would fit into all this, especially as Bernie is its representative and is being touted as the leading force behind a new series. CVC acquired its holding by being the latest in a long line of CRHs (Commercial Rights Holders) but the original sale by the FIA was to Bernie himself. So my first question is this: Does the contract with CVC remain valid if an entirely new group is set up to run F1? We know, for instance, that a clause in the contract gives the FIA the option to forbid the sale of the rights to anyone it deems unfit. Are there other clauses that could enable Max to make life very difficult for an independent organization? There are rumors that CVC is considering a sale of its investment to News Corp. It would seem fairly obvious that the FIA could fight this by invoking their oversight clause and so scupper the new series' financial arrangements. Or would the contract be valid at all, considering that F1 would be renamed and run by an entirely new group? Would the rights have to be re-sold or could Bernie's new series keep them to itself? And how likely would Bernie be to lead a breakaway that effectively divests CVC of its holding? Perhaps I am missing the point and the whole idea is for Bernie/CVC to increase its ownership of the sport beyond the finances. Maybe Max was inadvertently right in his letter to delegates when he accused the CRH of wanting to govern the sport as well. But are we afraid that they would make a worse job of it than Max? It all looks immensely complicated to me and could become a happy hunting ground for lawyers for decades. But I could be wrong, of course, especially as I cannot see Bernie embarking on a course of action that threatens the empire he has built so carefully over the years. Who knows what devious plans lurk in that feverish brain? So I am doing what is supposed to be good blogging policy but a very rare thing for me - I am asking what you think about all this because, quite frankly, I don't have any answers myself. Alianora to the rescue! I'm not sure of how much "skin in the game" Bernie has in CVC, but isn't he just manouvering to have both bases covered? If the rights are sold to News Corp he gets a lot of cash to set up the breakway series "Bernie 1" and will remain very rich. If not, he sits tight and... remains very rich. I think Bernie's bored. He ruled F1 while he owned it, and now that someone else holds the purse strings, he's looking around for something else to poke a stick at. I'm sure he misses the days when he was Emperor, but I also think that since he made his money on the sale, he might be inclined to carve out a bit more of the financial pie to the teams, as long as it doesn't hurt CVC's bottom line. I'm afraid I can't predict which way it will go, but I seriously doubt that Max would allow Newscorp anywhere near F1. As far as the original question is involved, the key is in the name. The contract the FIA has with CVC only covers the "Formula 1 World Championship". Note carefully the wording, for any other variant (including F1, Formula 1 and Grand Prix) is technically not copyrighted and therefore cannot have its rights sold to anybody. CVC is obliged to sort out the financial arrangements of the "Formula 1 World Championship" until 2110 or someone else buys them, whichever happens first. It cannot take steps to disband it. If it is written anything like a normal, sensible events contract (possible but not guaranteed with the FIA involved! ), it will have a fidelity clause preventing CVC itself from being involved with a rival championship in any way, shape or form. This must be defined fairly tightly because CVC was allowed to hold onto MotoGP until the EU objected and asked it to pick either MotoGP or the Formula 1 World Championship to avoid a monopoly situation. Between 1981 and 2001, there were a lot of clauses in contracts that prevented a rival championship from being set up. For instance, any car series with engines above 1 litre that held a Formula 1 World Championship was obliged to run it past the FIA first (who would run it before Bernie in turn before sending the - almost invariably negative - decision back). However, the EU put a stop to that just before Bernie bought the media rights to the series. Since then, there has been nothing to stop a rival series in principle except for the standard fidelity clauses. For the teams and those controlled by the teams this was (part of) the Concorde Agreement, for officials and drivers it was the licence requirements, others by individual contracts. Journalists do not appear to be bound that way, but the FIA probably doesn't think they can set up a rival series on their own. The fact that Grand Prix racing itself owes its original existence to a French newspaper magnate is apparently not relevant. - it cannot use any team currently in F1 until 2012 because of individual agreements to be in F1 and use the FIA as legislator under the remit of the Concorde Agreement (which is, among other things, the fidelity clause for the teams). However, a savvy team owner could set up an offshoot of the organisation for the purpose of competing in the new championship whilst completing their obligations to the old one (though the consequences if discovered by the FIA would be quite harsh unless there was a good cover story - an alternate brand with different decision-makers under the same umbrella, for instance). - it cannot use any of the same officials as the FIA. In a way, this could be the biggest stumbling block because the FIA is by far the largest trainer of marshals. Apart from the USA, nowhere else has sufficient independent marshal infrastructure to support the network of marshals an independent series unable to access FIA marshals would require (the likes of A1 get away with it because they're not seen as rivals to the FIA's supremacy - yet). The contract would be valid, but since someone else would be holding it, the rival series organisers would only need to know its terms in order to help it fight off anything the FIA and its new rights holders might attempt to destroy the budding series. The same applies if a third party wanted to do a rival series while CVC still held the "Formula 1 World Championship" obligations - though in that case it would have the disadvantage of having to fight Bernie as well as the FIA (and therefore find persuasion, threats and dollars blocking most doors). If CVC kept Bernie on while doing a rival series, or Bernie died before it happened, it would be a lot easier to set up a rival series. In addition, it would not have the full insight into the powers and restrictions of the Formula 1 World Championship series afforded by having once held the contract. Andy: It could well be that Bernie is positioning himself to profit from whatever happens but I'm not sure that he is in as much control as everyone seems to think. It looks to me as if Max has got the better of him several times recently, thereby shattering the illusion that Bernie always wins. It's a finely-balanced contest and the result might surprise us yet. Arnet: We live in interesting times. Bernie is beginning to look his age and it wouldn't surprise me if he sees this as the last fight he's going to enter. He looks tired, to be honest, and I really can't believe that he went into the struggle with Max deliberately (look at how he has tried to be tactful in advising Max to quit). I do think he is aware of the damage Max has done to the sport and that this still matters to him - he may well see the whole thing as a battle to ensure that F1 survives in recognizable form. The threat to set up a rival series is probably just that - a threat - and Bernie is hoping that it is sufficient to push Max into resigning. Fat hope there, of course. I have the terrible feeling that Bernie will lose this one. Alianora: Once again I am deeply indebted to your incisive assessment of the finer points of F1 contracts and deals. Thank you. It seems to me that, if a rival series were to be set up, CVC could be left high and dry holding the rights to a defunct championship. As you have explained, it's a big "if" and would require a massive effort from the competing organisation. The one weakness in the defence set up by the FIA would seem to be the Concorde Agreement. Since the FIA is arguing that there isn't one at present, the teams could consider themselves no longer bound by its provisions (even though it has suited them until now to maintain the old agreement's continuation). That is a matter for legal wrangling, no doubt. Even so, I agree with your view that a mass departure to a new series is extremely unlikely, even though Ferrari are supposed to be interested. The enormous logistical exercise it would be almost guarantees that it won't happen. But a lot of strange things have been happening in F1 recently and I wouldn't put this one as completely impossible. As ever Ali has every question answered. The wasy I see it. The FIA own F1 and CVC are the CRH. The FIA must run a championship for F1 and CVC must meet the obligations of the CRH. Any new championship belongs to whoever sets it up. There is absolutely no need for Bernie to involve CVC or anyone else if he sets it up. The teams won't let him have the financial benefits CVC get from F1 but he could find himself in control of the new championship. I would have thought it likely that any new championship would be broadly structured like CART with the team owners forming the board of directors. That is pretty well how I see it too, Steven. The major proviso to it is that somehow the current entrants to the F1 Championship manage to desert to the new one, whatever it is called. And that has to be all, or nearly all of them. Otherwise it will fail and we'll be left with a Champ Cars/IRL situation with neither series healthy. And that is why Ferrari becomes so important to the equation and why it's big news for Bernie to be seen having lunch with Luca. Alianora begins with an excellent point; the wrangling regarding the intellectual ownership of the letter F and the number 1 with regards to this blog's subject has already ended: "F1" is too obvious to be a trademark, and simpler terms like "Formula 1" and "Grand Prix" can be used to describe things that do not define or no longer define the motorsport that is the subject of this blog. Grand Prix One World Championship, for example, would be reasonable, though somehow I'd expect it to be largely a driving championship, and not an engineering one. So a horse by a different name can still be a horse if we recognize it as such. It appears that the problem is that there is no way to get the right people in a breakaway sport quickly enough to matter, if the Concorde Agreement and other such fidelity agreements remain valid. I don't think this is like the CART/IRL situation- I think this is like the CART/USAC break, of the 80's. The CART setup was indeed a formation of several teams that decided they wanted a better share of revenue than the Hulman/George family run setup could provide, but in time the teams showed they were terrible at managing money for the greater good of the sport. The CART/IRL split of the 90's was a brash attempt to resolve that problem, with Tony George's wrest of control back to his family driving the sport to ruin. While there is danger in having a single, centralized figure running the entire process, there is also danger in having the inmates run the proverbial asylum, so I hope it is recognized that we need a happy medium, not just a breakaway for its own sake. I wouldn't put any particular weight on Ferrari expressing an interest in a breakaway - they expressed interest (and more) in the GPWC breakaway attempt and then backed out at a critical moment to help collapse it. I think if I were to invite Alianora and Paul Stoddard over for dinner to talk about Formula 1 I would probably end up with more information in my head than I could possibly process! Thank you Ms. La Canta. It occurred to me in reading over all the above posts: wouldn't CVC have a non-compete clause with Bernie? As for the non-compete clause, Arnet, I have no idea. Wouldn't that be ascribing a lot of foresight to CVC, however? When they bought the rights, there was no sign of trouble on the horizon. It is rarely I disagree with Ali but I think Arnet is on to something. It is standard practise to put a non-compete clause in any contract so there must be one. It will depend on how it was written. If it only mentions one or more of Bernie's companies then all he has to do is set up a new company and he is in the clear but I would think there must be some kind personal service contract with Bernie and that must have his name on it. Saying that I would bet on Bernie having the best lawyers. This article is very timely, as the Chairman of the Australian GP Commision is in London today to meet with one Bernard Eccelestone with a view to extending the contract to run the Melbourne GP. Of course I will be rapt if a new deal is hashed out between them - but then what happens if there is a breakaway series? Do we have to do it all over again? Interesting point, Peril. I think the potential split is the reason for Ecclestone suddenly becoming more amenable towards the Oz GP owners - he wants as many supporters as possible. If that is the case and a new series did result, Bernie would be honour-bound to keep the Australian event going.